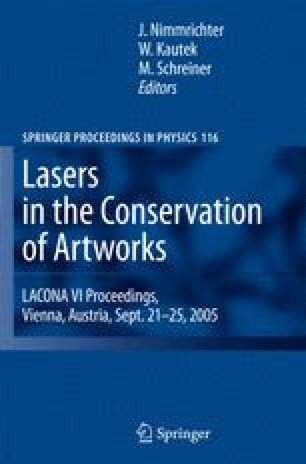 Three different undyed, unweighed silk fabrics (new clean, new soiled, and naturally aged) were cleaned with a computer-controlled Q-switched Nd:YAG laser at 532nm in 30 combinations of fluence and pulse numbers. They were studied for chemical change by viscometry, X-ray diffraction, and FIB-SIMS in combination with temperature calculations. While physical changes only occurred above the tested parameters, chemical changes could be detected as low as 0.2 J cm?2 with four pulses. Yellowing was observed at lower and bleaching at higher fluence/pulse number combinations. Melting was observed in naturally aged silk cleaned with 64 pulses at 4.2 J cm?2. The temperature reached at 0.1 J cm?2 is sufficient to evaporate carbon. Excess energy is transferred into the silk substrate causing thermal degradation. Different chemical processes leading to chain scission and to crosslinking seem to occur simultaneously, even at low fluence and pulse number. An increase in pulse numbers also leads to increasing damage.